Home / Featured / The Golf 420R will be a reality for 2015! News in from Car Magazine! It’s the first official confirmation that VW will launch the Golf R400 concept as a production car. And it sounds like it could become the hottest hatch of all, as the GTI rat race continues to gather momentum. “Volkswagen is readying a red-hot Golf hot hatch with more than 400bhp – and the project has now been confirmed to CAR magazine by VW group powertrain chief Dr Heinz-Jakob Neusser. VW Golf R420: the lowdownThis will be the first road car in the VW empire to premiere the high-output 2.0-litre turbo engine already seen in Audi’s TT420 concept car. Final power outputs are not yet known, but CAR expects somewhere between 400-414bhp [420 metric hp, hence the name], sent to all four wheels to stop the front wheels lighting up at every traffic light. Don’t worry: there is no Max Power bodykit lined up for this uber-Golf. CAR understands that it’ll continue the understated, classy look of the GTI and R, but with a new spoiler and aero pack with splitters and extra addenda. The brakes will be beefed up to cope with the extra oomph, but the track remains stock Golf. This has to fit down a regular Wolfsburg production line – it is emphatically not a limited edition car, according to our sources. 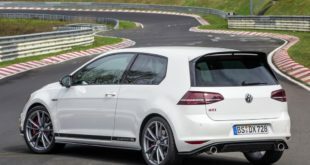 When can I buy the super Golf hot hatch? Word is the c400bhp VW Golf hyper-hatch is destined for a Frankfurt motor show debut in September 2015, with first deliveries pencilled in for late 2015 or early 2016. However, we also know that VW is preparing a couple of hot Golf GTI concepts for the 2015 Worthersee festival in May: a faster model, one prepped by VW apprentices and a wilder, crazier Golf concept. To early to say definitively, but we hear that it will cost less than €50,000 in Germany. That means sub £40,000 in the UK, compared with £32,000 for a Golf R and £27,000 for a Golf GTI. Next The XL Sport. Why ‘Bluemotion’ does not have to be boring.